Get started now with the MIND videos. Free! The MIND Series will set the stage for drummers to optimize their yoga practice! WHATEVER IS GREAT AND ALIVE IN YOU AS A DRUMMER, YOGA4DRUMMERS WILL INCREASE YOUR ACCESS TO IT SO YOU CAN BECOME LEGENDARY! Imagine - increased stamina, focus, fluidity and overall enhanced musical expression! 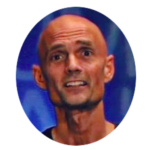 THE YOGA4DRUMMERS PROGRAM IS ONLY 8 CENTS A DAY! Lectures, Demonstrations, Video Instructions, an Informative Weekly Lesson Blog for a High Vibe Lifestyle and more! Plus access to my nearly 30 years experience in the field of yoga, meditation, and therapeutic bodywork - AND a lifetime of drumming at your disposal. I'll share the same practices that transformed my life from serious illness to extraordinary health! "It's Simple. You Are the Most Important Tool of Your Trade!" We all understand the value of getting the best gear to optimize our sound - but what about you? Let's face it, if there isn't enough wind in your sails, or you are playing with pain or injury - even the best kit won't get you where you want to go. That's where Yoga4Drummers comes in! For millennia, Yoga and Mindfulness have been considered valuable self-care and personal transformation practices. Even today, they are widely recognized as essential practices for peak physical performance and optimal health and well-being. And now you can benefit from these time-tested practices! |Join the ranks of the Marines, LeBron James, the Seattle Seahawks and many others who are leveraging the benefits of Yoga to excel at their craft. Yoga4Drummers is loaded with everything necessary for you as a drummer to access your greatest potential while having the best days ever! Reason No.2 In Today's Industry You Can't Afford Down Time...Let Alone The Cost Of A Dr's Visit! But you can afford the $28.18 Yoga4Drummers annual membership fee! About 13 million Americans (yes, including drummers), will visit the doctor this year for back pain. According to Blue Cross, the Average Cost of a Drs. visit is $130-$180. Ouch! That hurts more than the back pain - or common drumming ailments like neck, shoulder, wrist or hip pain for that matter. Yoga4Drummers, like brushing your teeth - keeps you smiling and feeling the best ever so you can max your time at the kit and balance the body afterwards! Let's Face It, You Do Your Absolute Best Drumming When You're Feeling High Vibe! Reason No. 3 You Don't Have to Feel Bad to Feel Better! You brush your teeth even though they’re not falling out. Right? Similarly, Yoga4Drummers is a preventive measure to ensure your drumming longevity, one you’ll be glad you began. 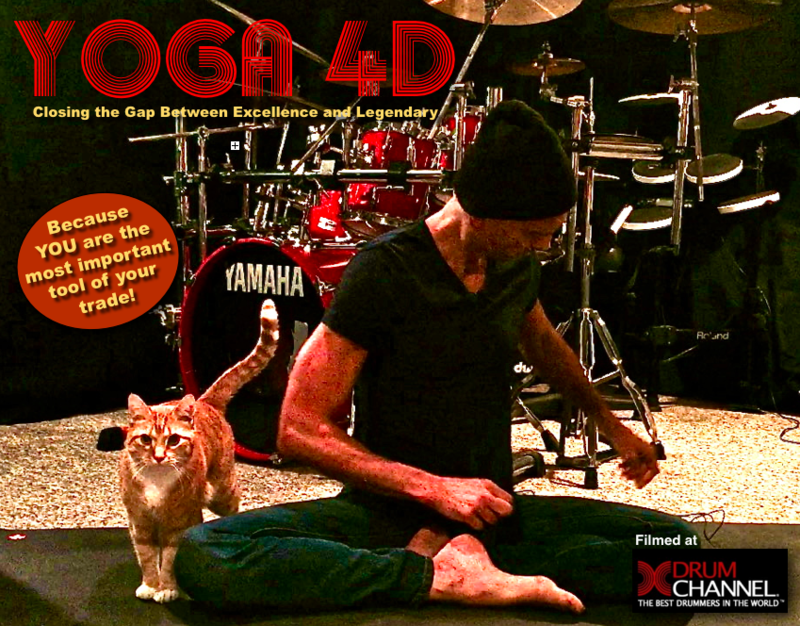 Even if you are on top of your game now, Yoga4Drummers can take you to the next level! Elite athletes are on top of their game too – but want more – to be legendary, and to excel without the likelihood of injury. 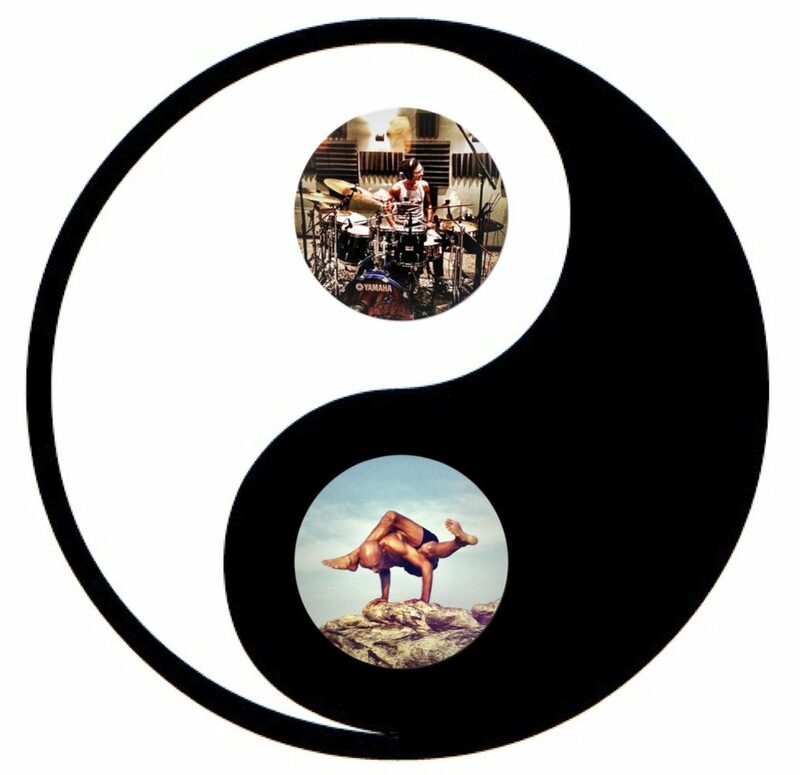 Yoga4Drummers is your ticket to ride that same train to being extraordinary! Reason No.4 You're An Alchemist! You have no idea how amazing you really are! Just look around. Literally everything you interact with was a vision - a dream, just like yours of being the best drummer ever. Anything is possible! For millennia Yoga, and Mindfulness practices have been recognized as transformative; ancient game changers. Practices, that when in the hands of a drummer like you, make you bulletproof and unshakable, rock solid in your groove, explosive in your solos, all while being as cool as an organic cucumber when under stress - able to dance easily and gracefully with life's vicissitudes. So What does this mean? It means DREAM BIG! Demanding road schedules, dissonance in the band? Ridiculous odd time grooves, playing the Grammy's for the first time... NO worries! Your high and grounded vibe cultivated by these practices, will make you smoother than Barry White when navigating such waters. Heck! Your chill vibe may even get you a side gig as a diplomat doing conflict resolution for the UN. Better yet, just think the Purdie Shuffle...Now that's smooth....!! Everything You Need To Raise the Bar On Your Drumming Experience Is In Here! Over 4 hours of Content, plus on-going lessons! Modules discussing the internal practice of Mind, Breath as well as Anatomy! Deconstructions of essential yoga postures, their relevance to drumming, and how to practice safely to optimize them for stronger, more flexible and comfortable ankles, legs, hips, low back, neck, shoulders and wrists - everything!. 5 progressively more challenging yoga sequences, including the YOGA4DRUMMERS sequence that will balance you after any amount of practice! Follow up lessons and updates on everything to make you the highest vibe drummer out there! Priceless information on Mindfulness, Yoga, Self-care...even Cosmic Consciousness, that will surely amp up your groove! You'll Never Stop! It's That Life Changing! More than a form of exercise, Yoga4Drummers is the perfect means to align more authentically with yourself and to become a force of Nature - and a Happy Vibrant one at that! You'll learn basic anatomy, mindful breathing for greater focus and more stamina, the internal energetics of the practice for faster recovery from long practices, rehearsals or over the top performances. Most importantly you'll learn how to keep the body balanced and harmonized so you can share your high vibe and heart through your playing and all your relationships - both personal and professional. What's could be more awesome than that? Right. Read on! This is all my best thinking in one place and your opportunity to leverage it! You'll have access to my over 28 years of experience as a therapeutic body-worker and yoga instructor, as well as a lifetime drummer. I've shared my expertise with clients spanning five continents, including a few Academy Award and Grammy winners (some folks you know well) and - many figures prominent in business and industry - (think Fortune 100.). In addition, I've worked with refugees in disaster and post war regions in Africa, South Asia and the Caribbean, incarcerated adults and youth, and those in drug and alcohol treatment; Not to mention beginner to advanced yogis at some of the top Yoga Shalas, Resorts and Health Clubs on the planet. Across the board and without exception everyone has been able to change their game with practices involving mindfulness and movement! Now, it's time to give back to the drumming community for giving the planet its groove! I'm Not Flexible Enough To Do Yoga? Is Yoga4Drummers For Me? Yoga is like growing a mango tree. There is no instant pudding with the process, and so it will vary from drummer to drummer. It really depends on where you’re at when you start and what your commitment is to practice regularly. We all have different physical histories and abilities which make the journey unique for each of us. It’s all about “showing up.” Wayne Gretske said, “We miss 100% of the shots we don’t take.” Yoga is the same way. “No practice, no change happening.” It’s that simple. Arrive at the mat, practice in earnest regularly and let nature take its course. Over time you’ll have practice that bears fruit for its lifetime. There is no substitute for working closely with a teacher with whom you resonate and who will support your personal development. I suggest Mysore Style Ashtanga Yoga, however there are many methods out there. When explored properly Ashantga Yoga benefits folks of any age, shape, and physical history. That said, the Yoga4D program is rich in content designed to: 1) Review anatomical considerations important for the safe exploration of yoga in any setting. 2) Deconstruct the yoga postures explored in the sequences to provide a clear understanding of their intent and how to practice properly. 3) Provide basic sequences arranged in an Ashtanga Yoga fashion to create greater, dynamic balance, strength and comfort in the drummer’s body. 4) Familiarize you with the “invisible” aspects of yoga – the internal practice that make yoga distinct from other forms of exercise. It’s a perfect way to “enter the stream.” The follow up modules will provide even greater clarity moving forward. NOTE: working regularly with an instructor can deepen your understanding of these elements. My Mind is Full On 24/7? How Can This Practice Help? We’re often told to pay attention but we are not taught how to. The practice of yoga cultivates a strong awareness of breath, mental activity and sensation through movement. Yoga’s mindfulness component strengthens our capacity to keep a moment-by-moment awareness of our what is occurring within the framework of the body: our feelings, bodily sensations, surrounding environment – (what comes through the five sense doors), and even our thoughts. It also develops greater equanimity – acceptance of what we observe or experience AS IT IS – without judgement. (The latter bit is the tricky part but science tells us that the benefits of are well worth the exploration!) For a drummer, this translates into greater focus, and even greater capacity to witness mistakes without derailing your performance – how to let it go. Greater focus also means more efficient practice time. Very cool! There’s a concept in marketing psychology that states that if it’s too affordable, customers will not recognize its value. Yoga, like meditation, was never intended to be offered for a fee. Yoga was meant to be universally accessible to all regardless of station or status. In this spirit, I want Yoga4Drummers to be available to all drummers. Ages ago, it was a student’s commitment to personal development to becoming one’s own master that teachers were looking for. That was the investment. Persistence to this end is more challenging than forking over large amounts of cash for such a program, and therefore the volition is said to have greater purity. There is a saying – “as is the seed, so is the fruit..” “as is your volition, so is the fruit of your actions…” The intent behind this traditionally based, universally accessible program, is that all drummers, through the insights gained by their practices, by living well for their own benefit and the benefit of others, and by enhancing their capacity to express authentically, will make the world a better place. And for this balance and harmony to then feed back into extraordinary levels of attainment behind the kit. 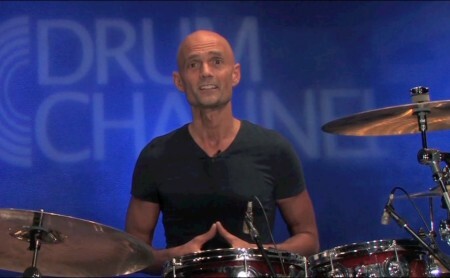 One more note – Many of you may have multiple memberships to other fabulous web-based drumming lesson sites. Me too. This can add up, and drummers may not have available resources to access information to increase their vibe. 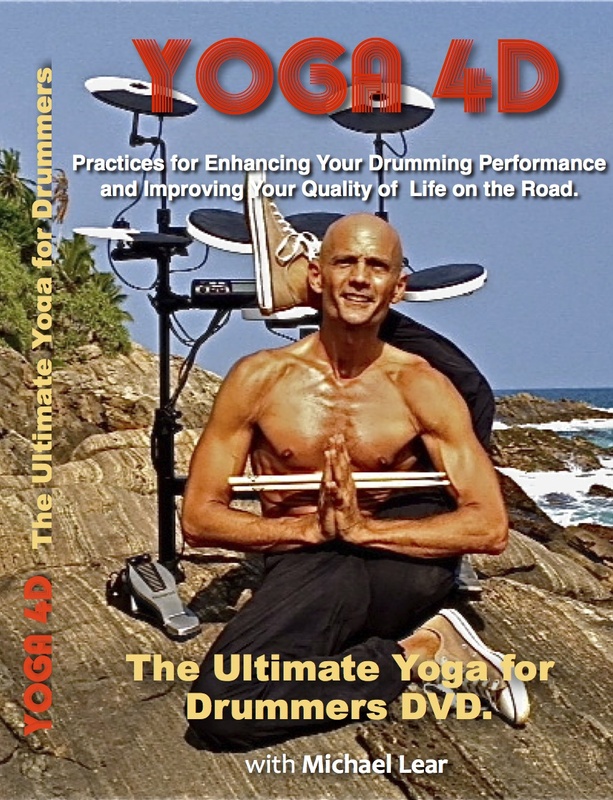 Yoga4Drummers is THE perfect, affordable and essential complement to all on-line drumming education platforms. Yoga is a process requiring commitment and dedication. Success is realized through continuity of practice over time. There is no instant pudding. Much like drumming, it's about building muscle memory through repetition over time. Your satisfaction and personal development are important to us. If you're not completely satisfied with your Yoga4Drummer's experience, let me know and you'll receive a full refund. We have your back on this! I'm In! Get Me Started! Nothing is true nor absolute. Nothing happens in a vacuum, and it’s best to not have blind faith in what you hear. What I share with you is my experience, my truth. Allow it to serve as a starting point for you exploration. Give fair trial to the suggestions and if you find the information applies to you, then and only then, it becomes your truth. This website offers health, fitness and nutritional information and is for educational purposes only. It is not a substitute for, nor does it replace, professional medical advice, diagnosis, or treatment of health conditions. Please consult your physician or other healthcare professional before beginning or changing any fitness program to make sure that it is appropriate for your needs; especially if you have a history of any of the following: ■ High blood pressure (you or your family) ■ Heart disease (you or your family) ■ Chest pain when exercising ■ Chest pain in the past month when not engaged in physical activity ■ Smoking ■ Have high cholesterol ■ Obesity ■ Currently pregnant ■ Bone or joint problem that could be made worse by a change in physical activity If you have any concerns or questions about your health, you should always consult with a physician or other health-care professional. Stop exercising immediately if you experience faintness, dizziness, pain or shortness of breath at any time. Do not disregard, avoid or delay obtaining medical or health related advice from your health-care professional because of something you may have read on this site. Current health and fitness research may exist that could impact the educational information provided on this site, and advice found here may not be based on the most recent findings or developments. Therefore, The use of any information provided on this site is solely at your own risk.